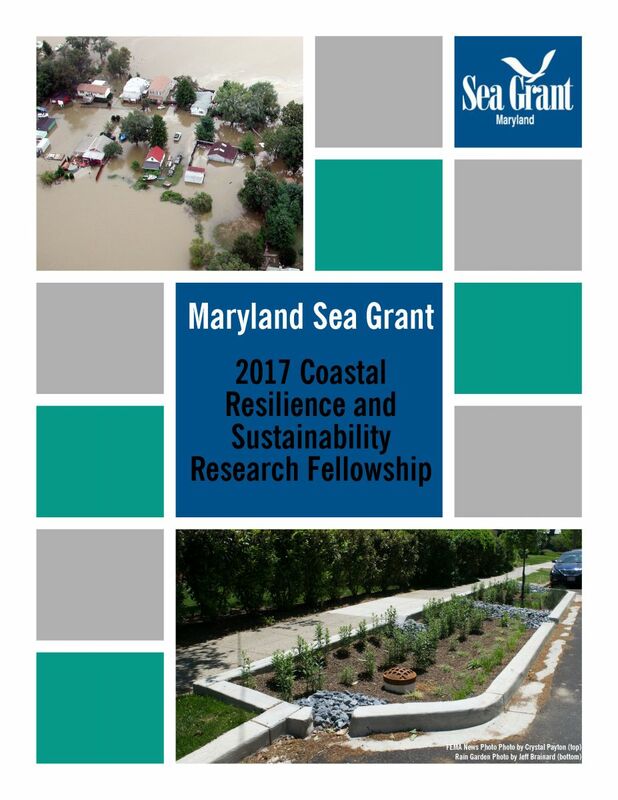 Maryland Sea Grant (MDSG) is pleased to announce the availability of coastal resilience and sustainability research fellowships for 2017. Fellows should be engaged in coastal resilience research that is relevant to Maryland and the MDSG Strategic Plan 2014 ­– 2017. In addition to supporting the student’s academic expenses, the fellowship will provide additional professional development opportunities in science communication, the science-to-management process and other relevant Sea Grant activities. MDSG is accepting applications until March 29, 2017 at 5:00 pm. Full official announcement and details of the fellowship can be found here. What coastal resilience and sustainability research is eligible? Research on wise use of water resources, stormwater, climate change adaptation, coastal processes studies, resilience from natural hazards, resilient coastal businesses and industries including fisheries and tourism, and other topics. Contact us to discuss your ideas! Students must be enrolled in or admitted to a full-time graduate or professional degree program at a Maryland or District of Columbia academic institution at a graduate level. Students who have not yet enrolled should submit a letter of acceptance from the dean of the graduate program through which they are enrolled at their college or university with their application package. Students may be working toward any masters or Ph.D. degree, as long as their coastal resilience or sustainability research is relevant to the mission and strategic plan of MDSG and has an emphasis on Chesapeake or coastal bays and their watersheds. The research must demonstrate relevance to coastal resilience and sustainability. The fellowship provides a total award of up to $45,000 in Sea Grant funds budgeted over 12 to 24 months. Non-federal matching funds equal to at least 50 percent are also required ($2 Sea Grant: $1 match). The anticipated start date is September 1, 2017. Acknowledge the support of MDSG in all relevant scientific presentations and publications. Application materials should use 12 point font (Arial preferred) and 1 inch margins. For your budget and budget justification, you must use the MDSG online project worksheets to create the budget (90-4) and budget justification forms. Please contact us early to request an account and receive guidance. Applications must be submitted online by Wednesday, March 29, 2017 at 5:00 pm as one PDF file to ww2.mdsg.umd.edu/rfp/fellow. Recommendation letters (signed and on letterhead) may be sent directly to Dr. Allen from the recommender via email at mallen@mdsg.umd.edu or postal mail.